We are told that all milk is the same. This is just not true. There have been at least two different kinds of milk for almost 200 years. There is the milk that has nourished humanity for thousands of years, and there is swill milk. Swill milk was invented to maximize profits at the expense of everything else. Dairy cows were fed the leftover garbage from making beer and other alcoholic drinks, instead of their natural food—grass. This brewery and distillery waste was called swill. Cows who ate swill were weak and sickly and had very short lives. Their milk was full of deadly bacteria that was often fatal to children. In fact, the city of New York once had a child mortality rate of 50%, largely because of swill milk. Swill milk was particularly deadly to the poor, as it was the cheapest milk available, and many parents bought it because they were short of money. Illness from raw milk was very rare before the introduction of swill milk. Millions of children died from swill milk. Pasteurization was developed to deal with the dangers of swill milk. While pasteurization may keep swill milk from killing people, pasteurization does not make the milk nutritious. There is a lesson in this horrible history. We should not feed garbage to milk cows. We should not feed garbage to any food producing animal. We should only feed these animals the food that nature intended for them. Swill milk had a devastating effect on my grandfather’s family. This led him to become the first dairy farmer in the history of his family. He produced clean, nutritious milk of the very highest quality from grassfed cows. This milk was not pasteurized, and was a blessing to his family. This post is part of Monday Mania Blog Carnival at the Healthy Home Economist. 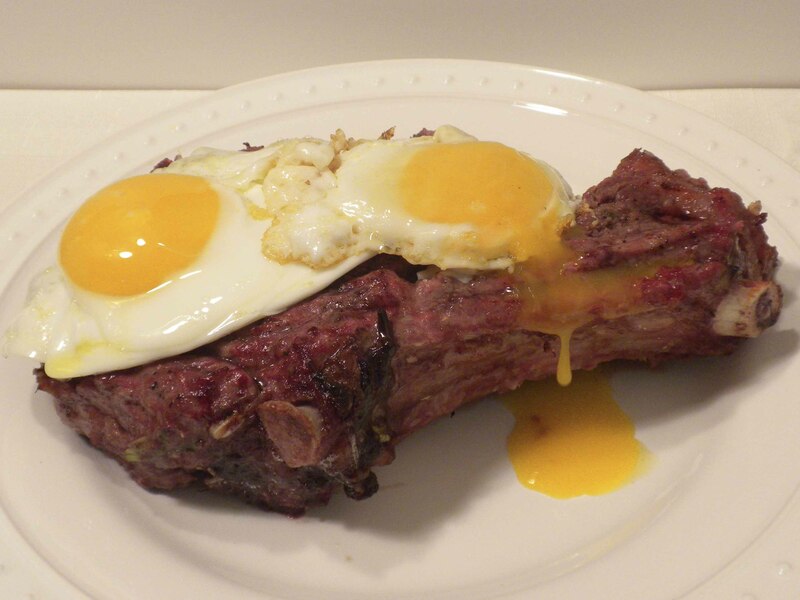 Grassfed rib steak with pastured eggs. Scarlet fever almost killed my mother. She was only ten years old. She could not eat while the fever was raging. Her wealthy parents hired a famous doctor to treat her. When the fever finally broke, she was emaciated, and so weak she could not stand. Her immune system was exhausted, and she was in great danger of dying from other illnesses. The renowned doctor prescribed—steak and eggs. Three times a day she was given tenderloin steak and eggs, all sautéed in butter, as ordered. At first she could not eat that much, but her appetite improved until she could eat the prescribed amount. Within a month, she regained her weight and health, and made a complete recovery. The very steak and eggs that restored her are now demonized as unhealthy. Actually, this traditional food combination is renowned for its ability to enhance and rebuild the natural functions of the body. Grassfed steak is a nutritional powerhouse, full of valuable nutrients, including high quality proteins, amino acids, and many crucial vitamins and minerals. Eggs, especially pastured eggs, are just as full of vital nutrients, including some nutrients that are very hard to find anywhere else. See Sally Fallon Morell’s Oral Testimony to the USDA Dietary Guidelines Committee. Eggs also contain high quality fats that aid in the absorption of nutrients. Together, steak and eggs are a wonderful nutrient combination, providing a full range of vitamins, minerals, fats, cofactors, and other nutrients that complement each other perfectly, aiding in the absorption of each other’s nutrients. Traditional peoples may not have known the science, but they did know it was good to combine steak with eggs. Steak and eggs were a valued combination in Russia, Poland, France, Italy, Spain, the Netherlands, Belgium, England, Germany, Portugal, and just about every other European country. This was true even though steak was very expensive in those countries. Steak and eggs were also very popular in the United States, Canada, Uruguay, and Argentina, nations where most people could afford beef. By steak, I mean the 100% grassfed and grass finished beef that has nourished humanity for thousands of years. This means that the cattle graze on living plants out on the pasture when the weather permits, and when grazing is not possible are fed dried grass or hay. Nothing else, and certainly not any added hormones or antibiotics. I do not recommend the grain and byproduct-fed factory version of beef. By eggs, I mean the whole egg. Yes, that includes the yolk, which contains almost all the nutritional value of the egg. A new practice has arisen in our fat-phobic modern society that would have astonished and outraged our ancestors—the practice of eating only the egg whites, while discarding the best part—the yolk. This reminds me of watching The Three Stooges when I was a child. I remember an episode where the Stooges broke eggs, threw out the contents of the eggs, hammered the shells into a frying pan, and tried to eat the fried shells. Throwing out the yolks is just as absurd. The makers of factory foods have always had a huge problem. The stuff they produce cannot possibly taste as good as real food. Also, the stuff they make cannot possibly compete with the nutritional value of real food. So they came upon a strategy that worked very well in the past and is still in use today—demonize good food. If people think good food is unhealthy for them, they will buy the artificial stuff out of fear. Massive marketing campaigns convinced people that foods that made their ancestors robust and strong were unhealthy. Cholesterol, which is a vital component of every cell in the body, was blamed for heart disease and a host of other illnesses. Ignorance, fear, and marketing have largely succeeded. Most people actually believe that eating steak and/or eggs will “clog their arteries,” and cause a heart attack. This is simply not true, as shown in the following articles— Cholesterol: Friend or Foe? and Cholesterol and Heart Disease: a Phony Issue. The food industry has made a fortune by convincing people to replace eggs with dried cereals, full of chemicals, in a form that never existed before the 20th century. The food industry has made another fortune by convincing people to replace meat with products made from soy proteins, full of chemicals, again in forms that never existed before the 20th century. No wonder they continue to demonize meat and eggs. Many modern people have never had steak and eggs. The basic idea is to sauté a grassfed steak in butter, and to sauté a pastured egg or two, so the eggs will be ready at the same time as the steak. 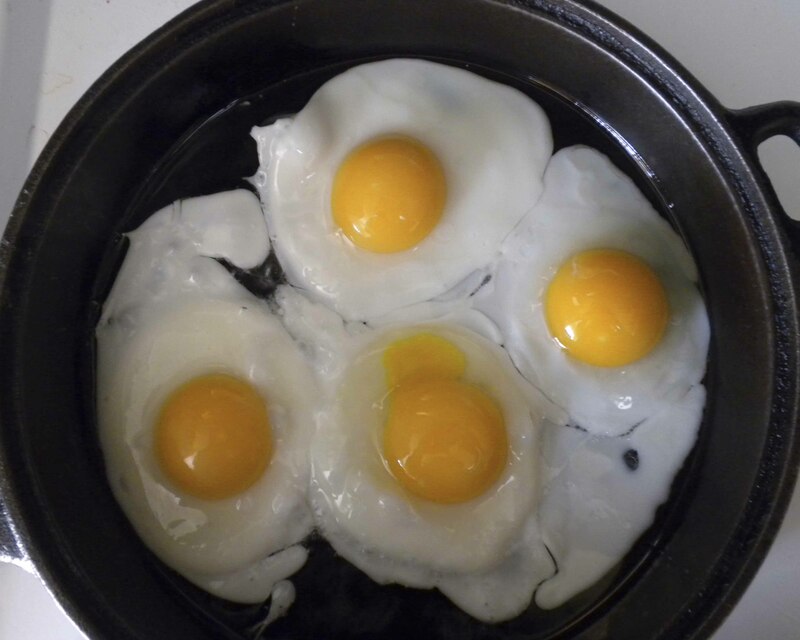 It is very important not to cook the eggs too long, as the yolks must remain liquid. When the steak and eggs are ready, place the eggs on top of the steak. The egg yolks provide a perfect sauce for the steak, and the combination is absolutely delicious. Tender Grassfed Meat has a recipe for this classic combination on page 68. 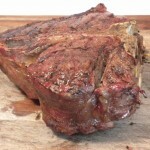 Tender Grassfed Meat also has a number of other recipes for steaks cooked in butter, every one of which can be enjoyed with eggs. Eggs are also a terrific side dish for steak that can be used by people who are avoiding carbohydrates. There is a reason why the combination of steak and eggs has been treasured in so many countries. They are wonderful together, both in taste and nutrition. This post is part of Real Food Wednesday Blog Carnival at Kelly the Kitchen Kop. This post is part of Fight Back Friday Blog Carnival at Food Renegade. Beautiful, pastured eggs like these could be restricted under the USDA's proposed dietary guidelines. The United States Department of Agriculture’s proposed 2010 Dietary Guidelines are an absolute disgrace. These proposed guidelines perpetuate and intensify every mistake made in the previous guidelines, demonizing and banning the very foods we all need to be healthy. These proposed guidelines completely ignore the research of Dr. Weston A. Price, who discovered what a healthy diet was in the 1930s, and ignore recent research that proved the previous guidelines were not based on science, but marketing. In fact, these proposed guidelines are even more restrictive and oppressive than the previous guidelines, and would make our people even sicker. They would, however, greatly increase the profits of Big Agriculture, who would sell the carb-heavy processed foods, and the medical profession and drug companies, who would have an ever increasing supply of sick people as customers. Fortunately, some excellent testimony was given in opposition to these proposed guidelines. Some of the very best testimony was given by Sally Fallon Morell, president of the Weston A. Price Foundation. The Weston A. Price Foundation has drawn up its own guidelines, which would restore health to our nation if followed. While we cannot impose these healthy guidelines on the nation, we can use them to restore health to ourselves and our families. The United States Government mandated dietary guidelines in 1994. These guidelines demonized eggs, butter, every animal fat, meat, organ meats, whole milk cheese, cholesterol, and every food containing saturated animal fats. These guidelines advocated a low-fat, high-carb diet, based largely on processed grains, fruits, and vegetables. These guidelines were imposed on every school lunch program that receives federal money, and on every government food giveaway program for the poor, and were followed by many other institutions. These guidelines were a complete and total failure. The health of the nation crashed as this diet was followed, especially in the children who had it forced on them through the school lunch program. Obesity, diabetes, asthma, Attention Deficit Disorder, severe allergies, and a host of other chronic illnesses became epidemics, especially among children. Now, in 2010, the federal government decided to revise the nutritional guidelines. These revised dietary guidelines were presented to the public for comment. The proposed guidelines demonize eggs, butter, every animal fat, meat, organ meats, whole milk, whole milk cheese, cholesterol, and every food containing saturated animal fats. The proposed guidelines advocate a low-fat, high-carb diet, based largely on processed grains, fruits, and vegetables. How are they different? They are worse. Under the proposed guidelines, eating even a single egg yolk in a day would be prohibited. The healthy animal fats that are absolutely necessary for proper nutrition are even more restricted. There is now so much solid research showing the benefits of natural saturated animal fats that the USDA Guidelines Committee was unable to demonize them on their own. Instead, the committee lumped these life-giving and absolutely necessary fats together with artificial, unhealthy trans fats under the label “Solid Fats.” “Solid Fats” are practically prohibited. People, especially children and pregnant women, would be unable to get the nutrients they need from their food, because many of these nutrients are only present in high-fat foods like eggs and butter. The proposed guidelines also greatly restrict salt intake. Salt is necessary for life as well as flavor, but this move will greatly increase the profits of the artificial flavor industry, including the MSG industry. Most troubling of all, these proposed guidelines recommend that the government find ways to ensure compliance. This opens the door for the government to tax or even prohibit vital foods like butter and eggs, forcing the American people to eat the factory foods made by Big Agriculture. Dr. Weston A. Price spent 10 years travelling around the world to study the diet of healthy peoples. He found a number of peoples who had no chronic illnesses, as long as they ate their traditional diets. These peoples were free of heart disease, cancer, tooth decay, asthma, allergies, birth defects, tuberculosis, arthritis, and all of the chronic diseases that plague modern humanity. All of these peoples ate huge amounts of foods high in animal and fish fats, such as butter, eggs, fish eggs, fatty meats, organ meats, whole milk, whole milk cheese—the very foods demonized by the proposed guidelines. Animal foods: meat and organ meats, poultry, and eggs from pastured animals; fish and shellfish; whole raw cheese, milk and other dairy products from pastured animals; and broth made from animal bones. Grains, legumes and nuts: whole-grain baked goods, breakfast porridges, whole grain rice; beans and lentils; peanuts, cashews and nuts, properly prepared to improve digestibility. Fruits and Vegetables: preferably fresh or frozen, preferably locally grown, either raw, cooked or in soups and stews, and also as lacto-fermented condiments. Fats and Oils: unrefined saturated and monounsaturated fats including butter, lard, tallow and other animal fats; palm oil and coconut oil; olive oil; cod liver oil for vitamins A and D.
Avoid: foods containing refined sweeteners such as candies, sodas, cookies, cakes etc. ; white flour products such as pasta and white bread; processed foods; modern soy foods; polyunsaturated and partially hydrogenated vegetable oils and fried foods. The Weston A. Price Foundation recommends that the foods actually eaten be of high quality through pasture-based feeding and organic, pesticide-free production methods. Everybody I know who has followed these dietary recommendations has seen the functioning of their body and its systems improve greatly. This is the way that human beings were meant to eat, according to nature’s laws. Dr. Price said that “Life in all its fullness is nature’s laws obeyed.” I have obeyed the laws of nature by following the dietary recommendations of the Weston A. Price Foundation and seen a huge and continuing improvement in all of the functions of my body. These are the recommendations to follow, not the industry-based recommendations of the USDA. No need for herbicides when you have goats. Note the contrast between the untrimmed and the goat trimmed areas. There is a better way to farm. A way that uses no chemicals. A way that renews the soil, rather than depletes it. A way that produces far more food. A way that produces healthy food that our ancestors would have recognized, food that our bodies are designed to use, food that makes us strong and healthy. We have been told that farms should specialize in one crop or animal only. We have been told that farms need to use herbicide to control weeds. We have been told that farms need pesticides to control insects, or the crops will be lost. We have been told that farms need artificial fertilizer so the crops can grow. Each one of these statements is not true. I recently had the pleasure of visiting a real farm, Chaffin Family Orchards, in Oroville, California. Chaffin has a different way of farming, a way that is the best example of sustainable agriculture that I have ever seen or heard of. Chaffin had caught my interest because they raised a large variety of fruits, as well as eggs, chickens, goats, and lamb, but what really caught my interest was a chance to buy some of the grassfed meat they raise. They do not sell meat over the Internet, so going to the farm or a distant farmer’s market was the only way I would get to try it. My first surprise came when I stepped out of the car. I immediately felt a strong sense of harmony. It was a very powerful, yet tranquil feeling, as if I was in a holy place. I am not a mystic, and I have felt that feeling only a few times in my life. Yet it was there. Keren, my wife, also felt it. As I toured the farm, this feeling was everywhere. It was as if the fruit trees, the grass, the cows, the chickens, the land itself—were healthy, well-fed, content, at peace, and—happy. There were no bad smells on the farm. None. Every other farm I have visited had plenty of bad smells, from manure, from the livestock themselves. Not Chaffin. We visited the cows, and saw the manure scattered here and there over the pasture. No bad smell. We visited the chickens, a lot of chickens. No bad smell. In fact there were no bad smells anywhere on the farm. Every other farm I visited had areas that smelled very bad. Not Chaffin. I had also visited a number of farms with livestock or chickens. Every one of those farms had swarms of flies and other bugs, especially in the summer. Not Chaffin. Not even in July. I did not see a single fly. There were very few bugs around. Chaffin raises olives, cherries, apricots, avocadoes, nectarines, peaches, persimmons, pomegranates, figs, grapefruits, lemons, and oranges. They also produce 100 percent grassfed beef, grassfed goats, pastured chickens, and pastured eggs. This huge variety of nourishing food is produced on one farm. The fruits are available only in season, when they are at the peak of nutritional value and taste. The beef is harvested only once a year, after the cattle have been eating the best green grass of the year and are at their best, both in taste and nutritional value. The same is true for the chickens, and the goats. The harvesting of food in season is how it was done through most of human history, and the results are absolutely wonderful. No artificial chemicals are used on the farm—none. This means no herbicides of any kind. So how does Chaffin deal with weeds, brambles, and thorny growths that could choke the fruit trees? The answer is very simple—cows and goats. The cows can graze among the trees, choosing the grasses they want to eat. The goats will eat bushes, including the thorny growths, as well as the weeds. The weeds and brush nourish the cows and the goats, who are eating what nature intended. The fruit trees give the cows and the goats shade from the hot sun. There is absolutely no need for herbicides, and none are used. Rotational grazing practices are used so the animals and trees support each other. Insects are not a problem at Chaffin Family Orchards. They use no pesticides. Instead, they move their chickens around in mobile coops as needed, to control the bug population. Bugs are the favorite food of chickens, who are not vegetarians. The bugs provide excellent feed for the chickens, resulting in the highest quality pastured eggs. The chickens are also able to forage for seeds and other plants, while on the hunt for bugs. The moving of the chickens is done on a rotational basis, in accordance with the needs of the land. I must say that the bug control method at Chaffin is the most effective I have seen at any farm. Chaffin never uses artificial fertilizer, yet the soil is incredibly rich and fertile. The cattle, goats, and chickens deposit manure on the land. Rotational practices are used so there is never more manure on the soil than can be ideally absorbed. The manure from healthy animals eating their natural diet is of very high quality and restores nutrients to the land. 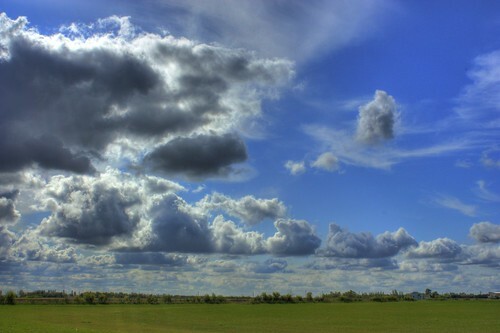 Land is often given a rest from farming or grazing on a rotational basis, which allows the soil to absorb nutrients, and allows dead plant matter to decay and enrich the soil. This provides incredibly rich soil, full of nutrients and minerals. Plants grown on this good soil are strong and healthy and very resistant to disease and insects. The fruit from trees grown on this rich soil is likewise blessed with a full complement of nutrients and minerals and is incredibly sweet and delicious. Animals who eat the plants grown on this rich soil are strong, healthy, very well nourished, and provide nutrient-dense meat and eggs. The plants, soil, and animals all support each other in this magnificent cycle which fully obeys the laws of nature. Chaffin Family Orchards produces a huge amount of different types of foods from the same farm, far more than if just a single crop was grown. The animals are raised on their natural foods. All of the many different fruits are natural varieties, including a number of heirloom fruits that are hard to find anywhere else, because they do not have a long shelf life. I might add that the heirloom Blenheim apricots were the best apricots I ever had. The incredible variety of nourishing food produced by this farm has no need to be modified or tampered with. We did come home with a moderate stash of grassfed beef from Chaffin, along with two pounds of Blenheim apricots. The apricots were gone in a day and really made me feel good after eating them. The beef had a clean, pure taste, like the essence of beefiness. 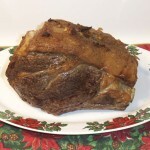 It was incredibly tender, and worked perfectly with the recipes in Tender Grassfed Meat. The meat had a beautiful coating of its own natural fat, which added greatly to the flavor and tenderness. I salute Chaffin for leaving some of the fat on the meat. Every producer of grassfed meat would do well to follow their example in this. It had great marbling, full of tiny flecks of life-giving, grassfed fat, and was absolutely wonderful. I will definitely have to make the long trek to Oroville again. I also want to add that we all felt good and renewed after eating this fine beef. 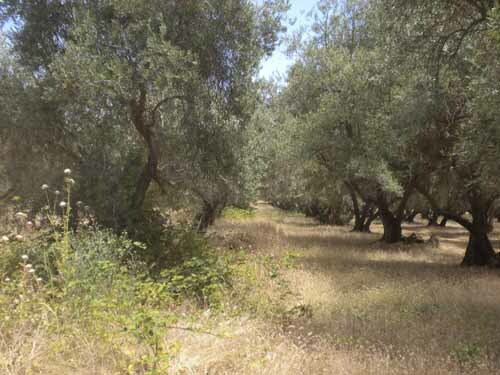 I should not forget to mention the olive oil, which is the best I have ever had, and works perfectly with the recipes in Tender Grassfed Meat. I have just scratched the surface of what I could write about Chaffin Family Orchards. I also want to thank their sales manager, Chris Kerston. Chris not only gave me a fine tour of the farm, but taught me so much about the kind of farming they do, and agriculture in general. Chris is literally a walking encyclopedia on farming, and I wish his methods were taught in agricultural colleges, rather than the factory farming that dominates them. Chris is absolutely passionate about his craft, and I am grateful to everybody at Chaffin Family Orchards for the fine food they produce, in the most sustainable way. Toothmarks show that this is the right amount of butter, as inspired by Sally Fallon Morell. Bread and butter were so traditional in Europe that they were usually served at every meal. In fact, the expression “bread and butter” meant something solid, valuable, and indispensible. Both bread and butter have fallen into disrepute recently, and are rarely eaten in their traditional forms. This is a pity, because bread and butter in their traditional forms were incredibly nourishing and formed the indispensible basis for every meal. What Happened to Bread and Butter? Butter in its traditional form was one of the most nourishing foods known in Europe. But butter was demonized in the United States and then the rest of the world. The reason for this was simple—the makers of artificial fats and margarine had a product that was totally inferior to butter, both in taste and nutrition. These artificial foods were not initially welcomed by the public, who preferred the traditional fats that had nourished their ancestors for thousands of years. Bread used to be made from sprouted grains and/or by a sourdough process. Both of these methods neutralized the antinutrient substances contained in grain and caused the bread to be more slowly digested, which helped to avoid insulin problems caused by an overload of carbohydrates. This traditional bread became very rare, and was replaced by modern versions that were made with heavily refined flour. The grain was no longer sprouted. People were eating a type of bread that they had never eaten before. Traditionally, bread was always eaten with plenty of butter. The two foods complemented each other. The butter facilitated metabolism, digestion, and the ability of the body to absorb nutrients. This butter was always made from the whole, unprocessed milk of grassfed cows, and was loaded with all kinds of vitamins, minerals, and a very special nutrient that Dr. Weston A. Price referred to as “Activator X.” The bread, made from sprouted grains, and often fermented by traditional sourdough methods, contained important nutrients, and provided a perfect vehicle for the butter. Just about every traditional European cuisine began each meal with this kind of bread and butter, which was considered absolutely essential for good health and digestion. Dr. Weston A. Price studied the diets of traditional peoples who were noted for their lack of chronic illness and robust good health. One of the peoples he studied lived in a rural area of Switzerland. These people ate superb grassfed butter slathered on traditionally made rye bread. Dr. Price studied the butter eaten by these people, sending samples to the United States to be analyzed. He found that this butter had an undiscovered nutrient which he called “Activator X.” Dr. Price’s research showed that people who had a plentiful supply of Activator X were much healthier than those who did not. The best source of Activator X in traditional European diets was butter. No wonder just about every European people would traditionally eat bread and butter at every meal. If you want to enjoy the traditional blessings of bread and butter, it is crucial to have the right kind of bread and butter. The modern factory versions are not what our ancestors ate and are different substances. The very best butter comes from cows who have been traditionally raised on green growing grass. Their butter is at its very best when they have been eating green, living grass, and traditional peoples timed their butter making to take advantage of the season when this grass was available. Butter like this is available today, but you have to make an effort to find it. Some local farmers make this kind of butter. Some nationally available brands that I have enjoyed are: Pastureland (sold by US Wellness); Trader Joe’s Organic Sweet Cream Butter (salted); and Kerrygold. Traditional breads are made from sprouted grains and/or traditional sourdough methods, from grain that has not been sprayed with chemicals. The Weston A. Price Foundation has done a wonderful job of identifying the right kind of bread and butter to eat. The best source that I have found for making traditional bread is Sally Fallon Morell’s magnificent cookbook, Nourishing Traditions. I have achieved wonderful results from To Your Health Sprouted Flour. It is crucial that the right amount of butter is used on the bread. 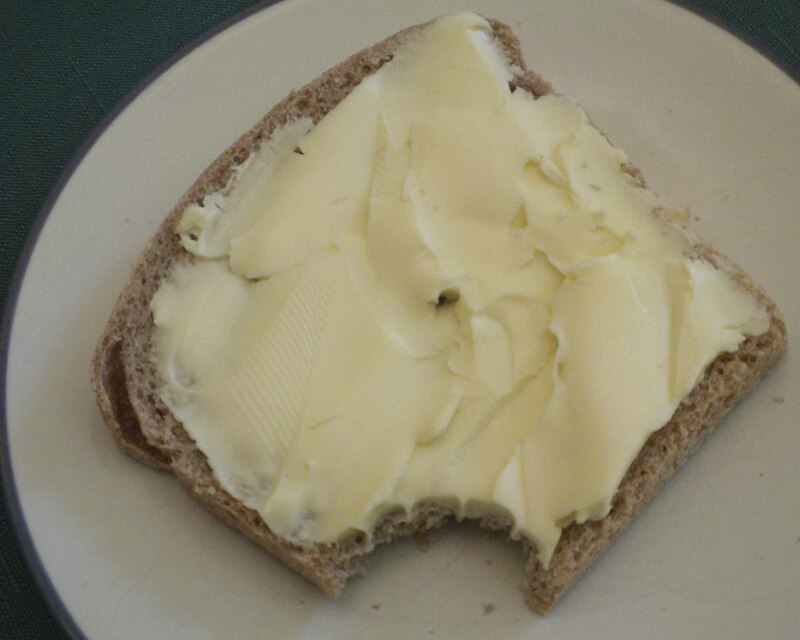 Most people have been trained to put a thin, pitiful, stain-like smear of butter on their bread, on the rare occasions when they allow themselves butter. The proper amount of butter to use is shown in the photo above, which was inspired a statement by Sally Fallon Morell that there should be enough butter on the bread to show toothmarks in the butter. What does bread and butter have to do with grassfed meat? Traditionally, bread and butter were always served before the meat in Europe, and provided a wonderful appetizer that helped prepare the body to absorb the wonderful nutrients in grassfed meat. Disclaimer: I do receive a very small amount of compensation if you buy Nourishing Traditions through this website. I do not receive any compensation if you buy any of the other brands mentioned in this article.